In 2005 a little girl named Katie Johnson was diagnosed with terminal brain cancer. Katie loved Star Wars and loved the color pink. When her health declined to the point she couldn't get out of bed, she said she wished she had a droid to watch over her like R2-D2 watched over a sleeping Padme in Attack of the Clones. Word got around fast to the Star Wars community: Katie's dad was founder of the 501st Legion Star Wars group. The R2 Builders group knew this was a job for them, and in mere months they constructed a custom R2 unit all painted in pink and dubbed her R2-KT. It rolled, it blinked, it even talked: Katie had a droid to watch over her! And she kept KT by her bedside through her final days. Katie's legacy lives on in her pink companion. R2-KT tirelessly tours the world, spreading the joy to Star Wars fans and a message of hope for kids who suffer childhood illnesses. R2-KT attends fan conventions, visits sick children in hospitals, appears in parades, inspires young girls that Star Wars has a place for them, and helps raise funds for a wide range of charities. In 2007 Hasbro produced an R2-KT action figure, which raised $100,000 for the Make-A-Wish Foundation. In 2008 Dave Filoni of Lucasfilm featured KT in a cameo role in the Clone Wars animated feature film, making her a canon member of the Star Wars universe! In 2013 KT appeared in the Star Wars Weekends parade in Disney World, then traveled to be a guest of honor at Celebration Europe II in Germany. 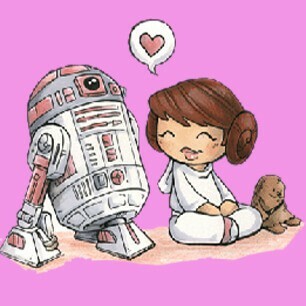 R2-KT has become a symbol of everything Star Wars fandom has come to represent: spreading the magic of hope. Get a touch of the green! R2-KT edited his profile info.